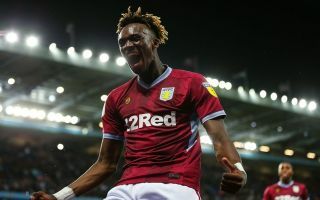 Tammy Abraham has sent a pretty clear message to Chelsea manager Maurizio Sarri over planning to fight for his place at Stamford Bridge next season. The 21-year-old is enjoying another prolific season on loan this term, scoring 21 goals in 31 games for Championship club Aston Villa. Long regarded as a top prospect for the future, Abraham could be the latest of many youth players to struggle to get a look-in at Chelsea, who are known for favouring big-money signings over promoting from within. Callum Hudson-Odoi has experienced this struggle in the Blues first-team this season, despite impressing whenever he has been given an opportunity by Sarri, and even making it into the latest England squad. Abraham seems determined to try to fight for his place with CFC as well, telling Sky Sports he hopes to grab an opportunity whenever he gets it. “That’s the aim going into next season. As a young kid, I’ve always believed I will play for Chelsea. I always believe that,” he said. Hopefully Sarri will be listening – that is, if he’s still even in charge of the west London club next season. A report from the Express states the Italian tactician may well be sacked over this international break following the defeat to Everton at the weekend.